Whenever you are offering anything to the public, the most basic and effective strategy is to give your customers or audience what they want. This is true whether you are in the world of entertainment, journalism, or business. My blogs are both a product I create in order to entertain and inform my audience and a way to benefit our members in order to advance my business. With that in mind, I spend some of my time looking at the efforts of other bloggers to see what works and what may be of interest to people. As you can imagine, there are millions of sites and topics to choose from in the blogging world. There are, of course, very serious bloggers writing about politics and business as well as those that write about more personal topics such as hunting, fishing, gardening, remodeling their homes, or the movies and books they like. If you can name it there is someone out there blogging about it and, much to my surprise at times, everyone seems to have an audience. I have already expressed my opinion in “The Blog Blog” about my lack of understanding over the popularity of shows or even blogs about such mundane subjects as pawn shops or repairing cars but they have large audiences so what do I know about what people want? In fact, there are times when I am not even sure of what I want. I watch the Food Network, for example, on a regular basis but even as I am watching I sometimes ask myself why in the world would I care to watch other people cook or eat? One thing I have noticed is the extreme popularity of anything involving cute babies, cute kids, cute animals, or cute anything for that matter. There are blog sites that I have found that have very large audiences even though they offer nothing more than pictures and stories about cute things. I suppose the attraction is that these images and descriptions give us a fleeting moment of relief from our cares and worries and that alone may be all that we really want. 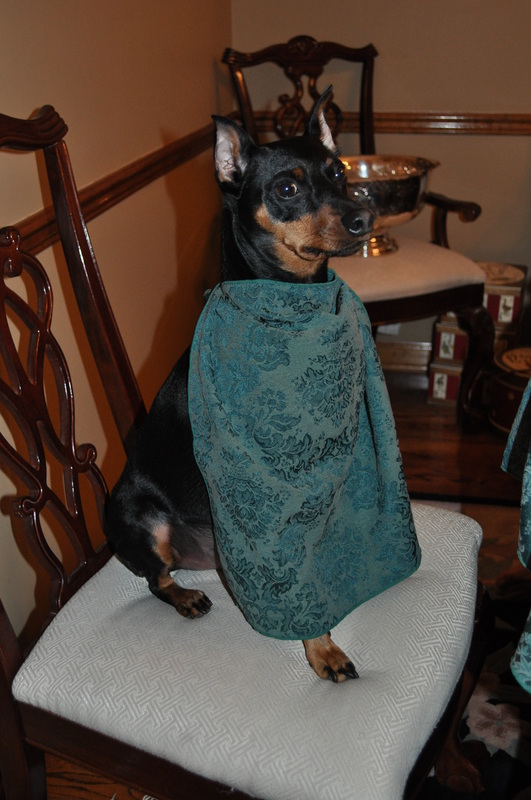 So, under the premise of if you can’t beat them join them, here are some cute pictures of my son’s dog Enzo at the dinner table. 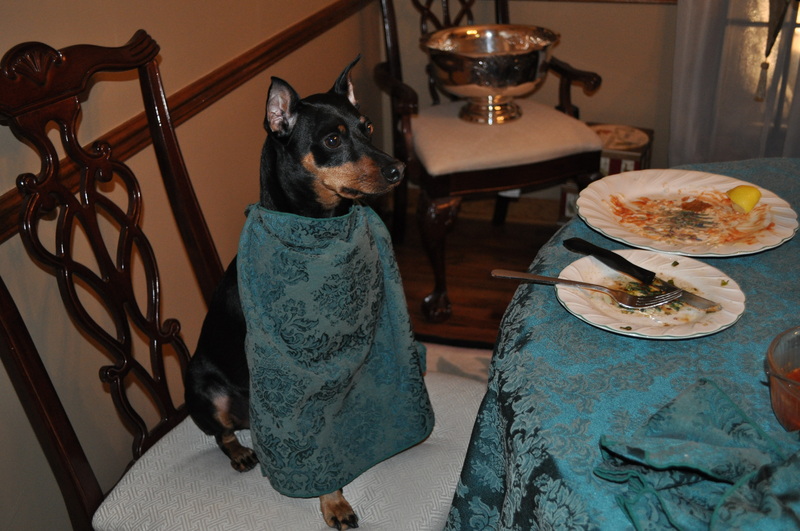 Enzo made for a wonderful dinner guest at our Christmas Eve dinner even if he was a little short on conversation. On Monday, Joe returns to a more serious topic with his opinion as to what the world might be like if we were to create too much of a good thing in “A Perfect World”. I decided to take a moment to write this blog entry about my experiences and thoughts regarding the process of writing a blog. It can be a chore to write something new each week but I take comfort in the observation that there appears to be nothing too trivial, mundane, or ridiculous that will capture the public’s attention. I have seen online videos that have gone viral that in a saner world would not have been of interest to anyone including the person’s family and close friends. There are popular television shows about people losing weight; about pawn shops, and about vehicle repair facilities. In a rational world, would anyone spend time, for recreation, at a gym to watch people get in shape, or find it enjoyable to spend a few hours at a pawn shop to marvel at the fascinating process of buying and selling used goods, or when was the last time you took a trip to your local car dealership just to watch them fix someone else’s car? The answer is, never. Yet, we will watch this stuff on television every week. I don’t fully understand the endless obsession we have with reality shows as if the reality of our own lives was not interesting enough. We will watch for hours, dysfunctional people in houses, on islands, at the shore, and in boardrooms. Do we really care which of a group of has-beens or unknowns can dance or sing better than the others? There seems to be no end to what we will find interesting, including such exciting things as cleaning houses, the incessant sniping of bored housewives, and my personal favorite, watching someone eat large quantities of food. I heard that there may be a show that will simply be about watching grass grow if they can figure out which type of grass would be the most interesting. Anyway, when I first started writing my blogs I had some concern that I may eventually run out of interesting ideas. Now, as I reflect on our popular culture I realize that there is nothing to worry about.